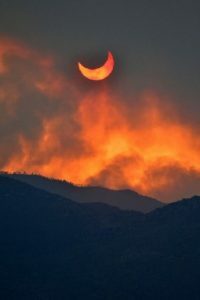 As will be shown in the following Preterist Commentary on Acts 2:19-20, the sun darkened and the moon turned blood red in A.D. 69, the year before the fall of Jerusalem, “the glorious day of the Lord,” in fulfillment of Acts 2:20: “The sun will be turned to darkness and the moon to blood before the coming of the great and glorious day of the Lord.” The following year, in A.D. 70, Jerusalem was conquered and burned resulting in a catastrophic loss of life fulfilling the “blood and fire and billows of smoke” in v. 19..
During a lunar eclipse the moon can turn blood red. 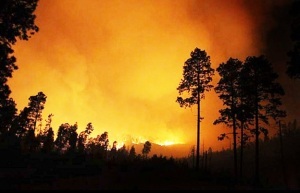 19I will show wonders in the heaven above and signs on the earth below, blood and fire and billows of smoke. 20The sun will be turned to darkness and the moon to blood before the coming of the great and glorious day of the Lord. A Preterist Commentary on Acts 2:19-20-The Blood Moon Prophecy: The Sun Darkened and the Moon turned Blood Red in A.D. 69, the Year before the Fall of Jerusalem, “the Glorious Day of the Lord,” in A.D. 70. Many Christians believe that vs. like Acts 2:19-20 are not meant to be interpreted literally.1 In other words, they do not believe that the sun needed to darken or that the moon needed to turn red during Israel’s first-century war with Rome as foretold in Acts 2:19-20. Rather, they believe that prophecies like Acts 2:19-20 were just symbols representing something else similar to how the seven-headed beast of Revelation represents the seven Caesars though there was no literal seven-headed beast. Is this assumption correct? Though it is true that the seven-headed beast of Revelation represents Rome and its Caesars, there actually was, in fact, a literal image of a many-headed sea monster that was visible to John’s first century audience that appears to be the literal, visible depiction of this empire. As shown in the commentary on Revelation there are few apocalyptic images in Revelation that were not in some way literal or visible to John’s audience. In other words, even the seven-headed sea monster of Revelation 13 was in a way literal and visible. See Revelation 13: A Preterist Commentary. In Luke 21:25 Jesus says that at the time of the end “[t]here will be signs in the sun, moon and stars.” If the sun, moon and stars were not literally darkened in Revelation 8:12 and the moon did not actually turn blood-red in Acts 2:20 and Revelation 6:12, then how is it that there were signs in the sun, moon and stars? If nothing actually happened in the first century to the sun, moon and stars to fulfill Revelation 6:12, Revelation 8:12 and Acts 2:20, then what were these signs in the sun, moon and stars predicted by Jesus in Luke 21:25? 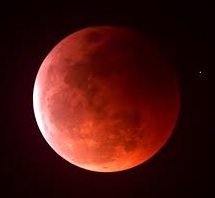 A Preterist Commentary on Acts 2:19-20, The Blood Moon Prophecy: The Sun Darkened and the Moon turned Blood Red in A.D. 69, the Year “Before the Glorious Day of the Lord” At the Fall of Jerusalem in A.D. 70. Preterist Eschatology, A Commentary on Acts 2:19-20-The Blood Moon Prophecy: The Blood, Fire and Smoke of v. 19 was Fulfilled in A.D. 70 when the Romans Set Jerusalem on Fire while running through the Streets of the City Spilling Blood While Slaying Everyone inside with the Sword. Roberts, David. 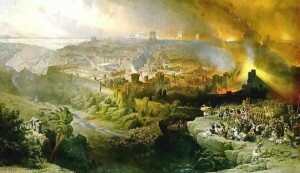 The Siege and Destruction of Jerusalem by the Romans Under the Command of Titus, A.D. 70 . 1850. Yeshiva University Museum, New York. Concerning the “blood and fire and billows of smoke” of v. 19, it is worth mentioning that in great fires like the burning of Jerusalem by the Romans in A.D. 70 the various colors of the fire itself can reflect in the smoke and sky such that the sky itself can appear to be on fire as suggested in 2 Peter 3:12. See 2 Peter 3:5-13: A Preterist Commentary. At the fiery fall of Jerusalem in A.D. 70, the city and Temple were destroyed and the symbolic meaning of the heavenly omens mentioned in Acts 2:20 were also fulfilled when the people of Jerusalem were captured and killed by the Romans. Preterist Fulfillment of Acts 2:19-20: Large Fires like the Burning of Jerusalem in A.D. 70 Can Cause the Sun to Darken by Smoke and the Moon to Turn Blood Red As It Reflects the Hues of the Fire in the Smoke. Similarly the red and orange hues of the fire can also be reflected on the moon turning the moon orange or red as often occurs in wildfires and other large conflagrations such as the burning of Jerusalem in A.D. 70. Likewise, the sun can also be darkened by the smoke from the fire especially from the perspective of those trapped inside the city while it burned. Here one can see another possible instance in which the sun may have darkened and the moon turned blood red in fulfilment of Acts 2:19-20, this time at the fall of Jerusalem in A.D. 70. As stated in this Preterist Commentary on Acts 2:19-20, the prophecy in which the sun darkened and the moon turned blood red was fulfilled in A.D. 69, the year before the fall of Jerusalem, or perhaps at Jerusalem’s fall in A.D. 70? The darkening of the sun and the eclipse of the moon is mentioned again in Revelation 6:12. When the sun and moon are darkened or eclipsed, this is a Biblical indication that the civil and religious authorities are about to be overthrown or killed. Psalm 72:5 says, “May he [the ruler] endure as long as the sun, as long as the moon…” Also in Isaiah 24:21-23, God overthrows the rulers of Israel and reigns in their place to the shame and dismay of both the sun and moon. In these verses Isaiah, like John in Revelation 6:12, seems to imply that signs in the sun and moon portent the fates of those in authority. When both celestial bodies are eclipsed this can be an omen that the reigns of the civil and religious authorities are at risk. 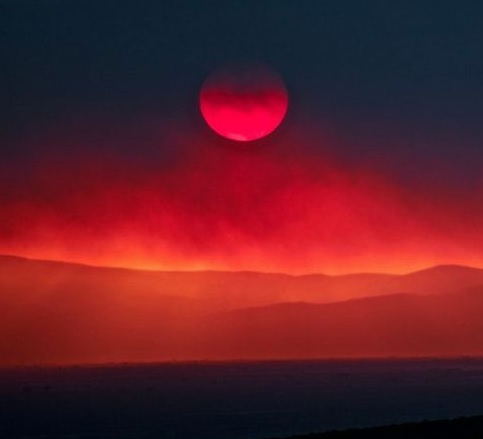 Perhaps it is not a shock that after seeing the sun turn dark and the moon, blood red, the people of the earth are said to flee for their lives in caves and mountains in Revelation 6:15. Cassius Dio Roman History 65.8. “At the same time this happened, Vespasian who was engaged in warfare with the Jews, learned of the rebellion of Vitellius and of Otho and was deliberating what he should do.” (Ibid.) While Vespasian, the beast whose wound had been healed, was in Israel, Nero died and Galba, Otho and Vitellius struggled against one another to claim the empty throne. Vespasian and many of his supporters were well acquainted with astral fatalism and would have seen this as a clear omen that Vespasian would soon become emperor. As stated earlier, the sun represents a god or king; thus the weak sun in the west would seem to represent Vespasian’s western rivals: Vitellius and Otho. Furthermore, the fact that this sun, representing the current self-proclaimed Caesar, was in the west implies that it is about to set. When the sun sets it appears to descend into the earth. This was seen by the ancients as a sign of the descent of a king or god into the underworld, the land of the dead. The bright sun in the east is Vespasian, the general of the Roman forces in Israel to the east. The falling star might be seen as the death of one of Vespasian’s rivals, perhaps Otho? This interpretation seemed to have proved correct. Vitellius had been killed, and Vespasian became the next Caesar. Josephus The Wars of the Jews 6.8.5.